Searching for a bronzer in this country could be difficult as I am well aware that the trend in Asia is to have whiter and brighter skin complexion, not tanned or bronze looking skin. We do have bronzers, but there aren't many to choose from and most of them come from high-end brands. The most raved Honey Bronzer from The Face Shop has been discontinued and I have not seen Essence Stay Matte Bronzer selling anywhere in my local pharmacies. So I left with plenty of choices. Even the bronzer that I am going to talk about is not in Malaysia's market but I still want to write a review on it as I believe Bourjois Duo Bronzing Powder is selling at Sunway Pyramid's kiosk. 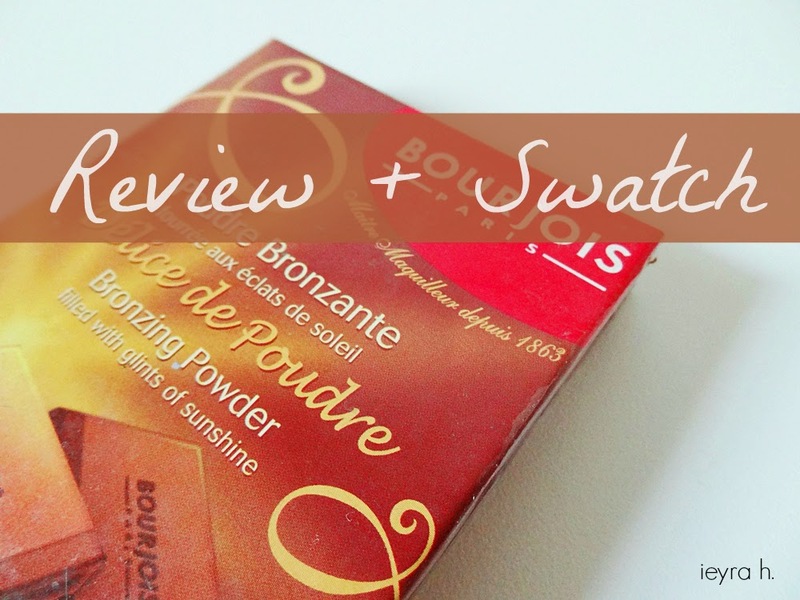 I got mine from Carousel, I found a seller that sold Bourjois Bronzing Powder at a reasonable price and I quickly made an offer. 'oh no! not my shade'. 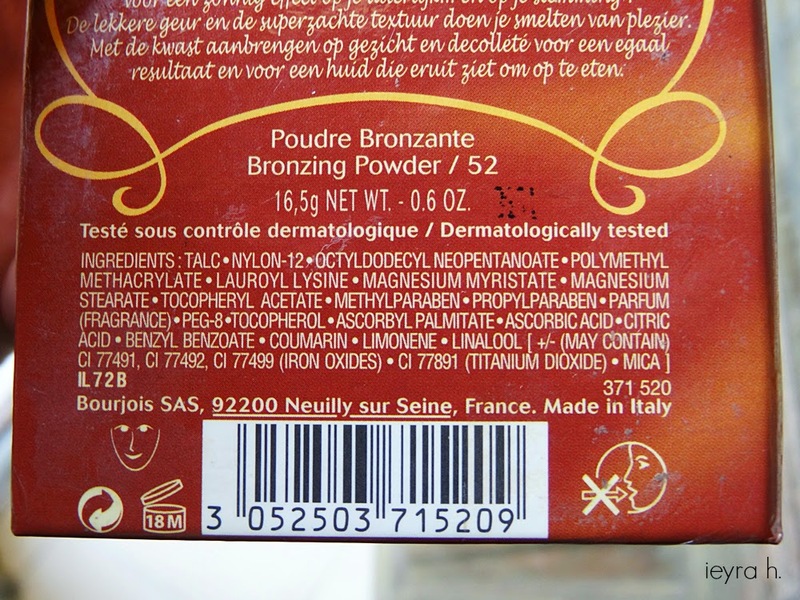 but let's read my further review on this bronzing powder, shall we? Firstly, I really like the packaging. It looked like a mini chocolate bar with a book-typed of opening. This Bourjois Delice de Poudre, otherwise known as the 'chocolate bronzer' do has a chocolaty smell in it. This bronzer would not take up many spaces in your makeup bag as it is slim and just the size of a palm - just the right size for blush to swirl around and takes up some products. Upon touching it, I am so impressed that this bronzer isn't at all powdery! It blends smoothly on each application. For me, pigmentation on this product its just medium; if you want more of a darker effect, you need to layer it up. 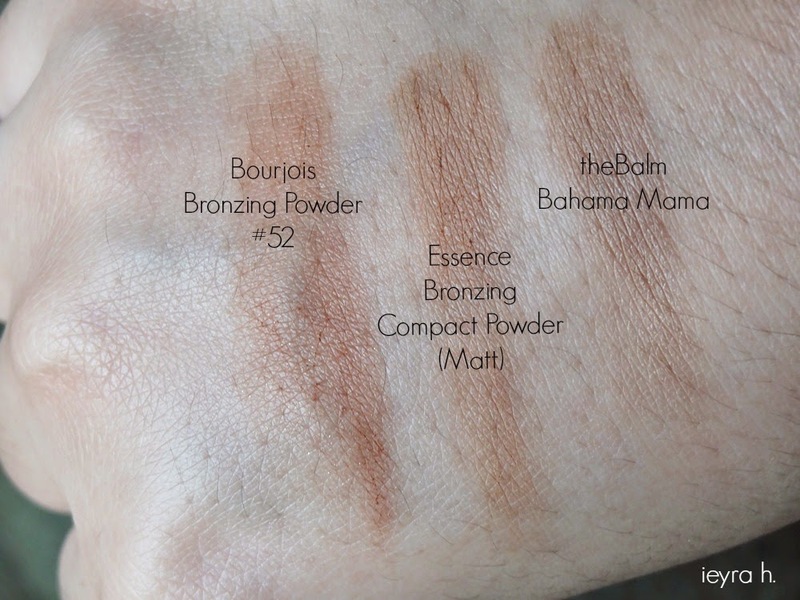 In this range, there are two shades offered by Bourjois. I have mine in the shade #52 and I would describe it as a warm brownish-tanned colour. Personally I am not keen on this shade. With a light hand, it camouflage with my skin probably because I am naturally warm but when I pile it up, it lean too much on an orange tone. People with extremely pale skin would find this to be a bit red. Instead of contouring, I use this bronzer to bring back some colours onto my skin if I apply lighter shade of foundation. It appearred more tan/red on me than my other bronzers. Noted that this is a slightly shimmery bronzer - it do not offer much favour in adding depth or shadow to your cheekbones but, I think it is a good sun-kissed bronzer or blush on those days you want to keep your makeup look at minimal. Unfortunately, it is not available in Malaysia but you can buy it from Asos. I am not completely blown away by this bronzer despite it being highly raved in the beauty community. However, I know it works wonder on many people especially with pale and fair skintones. On warm-medium to tanned skin, it either do nothing or leave very subtle contour effect unless you apply it heavily. Honestly, I don't think it would be flattering on yellow skin toned, but that is just my opinion, haha. Bourjois has one similar in packaging paired up with a highlighter, do you know it? I've been looking for it for a while but I cannot find it :) My fav bronzer right now is actually a blush from Essence, 40 Natural Beauty, it's shimmery though! Thank you for the review! I really liked how you compared three different bronzers. I only own two bronzers and the one I like better is - not supprise - hola from benefit. Although I am looking for a more grayisch/taupe one because that might suit my very pale skintone better when conturing. Hehe. Betul! have you tried Too Faced's Chocolate Bar before? this smells nicer than that! Yes! :D From what I heard through local beauty bloggers, Bourjois actually brought that out in one of the store here. Too bad I live far from it. My holy grail bronzer at the moment is the matt bronzer from Essence! It has been the ONLY contour colour that suits me for my nose contouring. LOL. I always don't do well with bronzer but I heard that Hoola is suitable for almost all skin tone. I swatched it before, still looked very muddy. Then again, I haven't really tried it on my face. Need to give Hoola another try! Thank You for your comment and have a good day! i've heard a lot about this, unfortunately we don't have bourjois here! I would definitely recommend the healthy mix foundation / serum. Most people like the latter but I haven't tried it yet so I couldn't compare. Hehe. And ohhh check out their Rouge Edition Velvet Lipstick; my favourite is shade 07! also love it more when you said it's smell like chocolate (chocolate lover here xp). but to bad we dont have borjouis counter in my city. I love that bronzer as well :D it smells great too!